I have been trying to save the more directly Halloween-themed movies on my list to watch closer to the holiday. Now that the month is more than half over, I rented All Hallows’ Eve. This poster caught my eye when I was looking for upcoming horror releases last year. That clown is probably the scariest clown I have ever seen! The synopsis read like a copycat of V/H/S, so I figured it would be a decent flick. A babysitter is watching two children after their night of Halloween escapades. While counting candy, the one kid finds an unmarked video cassette (and immediately knows what it is, which I don’t believe a kid from this generation would) and begs his babysitter to let them watch it. There are three tales told on the video about demons capturing women in a train station, an alien home invasion, and a serial killer who just won’t quit. The short stories are all tied together by the malevolent clown, who seems to be the devil pulling the strings behind the scenes. I felt that the over-arching babysitter storyline was more interesting than the meat of All Hallows’ Eve (the video tape vignettes), whereas in V/H/S the viewers of the tapes only served as a narrative paste to hold the featured tales together. The weakest of the stories was the alien attack. It was like a 6th grader’s class project. The costumes where poor looking and the plot stood still. I think the best of the trio was the last one, predominantly highlighting Art the (silent) clown. This segment is actually a short film from back in 2011 called Terrifier. I also thought the ending of the babysitter’s night was well done and at times reminded me of The Ring. Despite how good I thought the babysitter hub plot was, I came to this movie for what was on the videotape, and that’s where All Hallows’ Eve falls short. 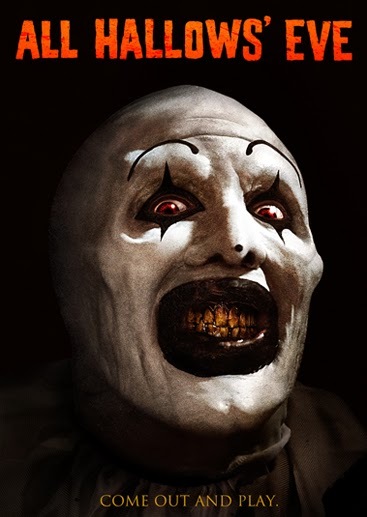 This entry was tagged All Hallow's Eve, Art the clown, Halloween, Terrifier, The Ring, V/H/S. Bookmark the permalink.